There’s really no other way to see The Crossing than how Alejandro Escovedo and Don Antonio Band presented it on Thursday. Most of the crowd, ostensibly, had seen Escovedo before, at least, or were longtime fans, at most. Perhaps some were aware of the backstory behind his latest album, but most were not, maybe only that the openers would later back Escovedo because they had played on the album. 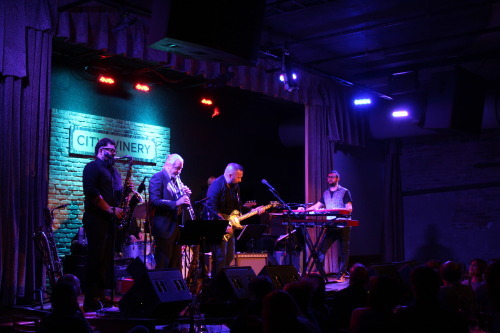 As such, Don Antonio Band played a set of self-described romantic Italian music, political in nature and exploratory of Americana in scope, just as it had existed before their lucky encounter. It was when Escovedo came out that he told the story of The Crossing. Years prior, he picked Don Antonio Band over a couple others to back him in Europe. They learned his songs, and upon practicing for the first time almost immediately after Escovedo and his wife arrived in Italy, Escovedo knew they were the right choice. They not only learned many of his songs with utmost precision and skill but brought their own local flavor to it, not trying too hard and letting their personalities naturally shine through. It was so successful that Escovedo and Don Antonio Gramentieri, the lead singer/guitarist and band leader, decided to write an album about two immigrants, one Mexican and one Italian, who came to America with dreams of rock and roll but discovered, as many have before them and many will in the future, that the country is not so nice to outsiders after all. And so The Crossing was born. It felt like Escovedo’s explanation of the album was essential, not in order to enjoy the music, but to appreciate the extent to which it was a collaborative effort between him and Don Antonio Band. And they played The Crossing songs and prior material equally well. They claimed they don’t know how to play rock and roll but burned through the gloriously messy punk of “Teenage Luggage” with intensity, played with gravitas catchy classic “Castanets”, and allowed Escovedo ample room to sing on “Sensitive Boys”. Considering Escovedo had a book of his own lyrics from which to read, it was almost as if the band knew his songs better than he did. Most importantly, the two found common ground in their politics. By the end of The Crossing, the Italian character has been killed by the cops. The implied question–is it worth it?–is left unanswered, as it is for so many who make the sacrifice of their own or others lives to come to the U.S. “I lost my innocence to the ICE,” Escovedo sings on the title track. “We found America in a punk rock way,” he continues, quickly avoiding romanticization by declaring, “This story has no ending,” the jagged edges of Gramentieri’s guitars embodying the sharp pains of the characters. The final song they performed on Thursday–Big Station’s “Sally Was A Cop”–was appropriate because it, too, essentially presents life as is, with some clear enemies (“crooked politicos”, “mercenary lovers”) to some unclear roles (“socialites, “psychopaths”). What’s key is that they’re all necessary to make society as is function. Escovedo and Don Antonio Band want to make that change through their music, but also through their stories.